I heard Abelardo Barroso for the first time in West Africa. It took me a few seconds to realise that he was singing in Spanish, as his voice fitted in very well with the African surroundings. I can certainly imagine why Bembeya's legendary singer Aboubacar Demba Camara was a fan. It took me a few years to fit the name with the voice, and the voice with the orchestra. And later still, I discovered that he sounds even better in Cuba! Ah what a delight, travelling through Cuba with la musica sabrosa of Abelardo Barroso and Orquesta Sensación ! 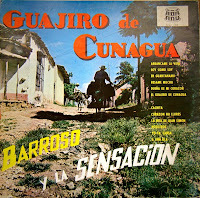 Even without the legendary singer Orquesta Sensación is worth listening to, as you can hear on this lp. Only four of the twelve songs feature Barroso singing lead. The quality of the lp leaves something to be desired, but this is compensated by the musical brilliance, I think. This will be my starting point in discovery of Cuban music. I downloaded this along with a few others but I'm in awe of the sheer fun this kind has. I'll be looking forward for more. Thank you for introducing me to so much over the years.